Campaign for the American Reader: Pg. 69: "The Fourth Perspective"
Robert Greer is a professor of pathology, medicine, surgery, and dentistry at the University of Colorado Health Sciences Center; founded The High Plains Literary Review and continues to serve as its editor-in-chief; is the author or co-author of three medical textbooks and over 125 scientific articles; and is an accomplished writer of fiction. 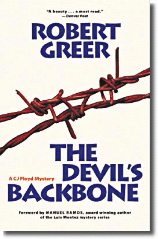 And that is just the bare bones of Greer's biography. His published fiction includes a collection of short stories and two medical thrillers, Limited Time and Heat Shock, as well as five "CJ Floyd" mysteries, the latest titled The Fourth Perspective. When I was asked to devote a few words to the issue of “page 69” in my new novel, The Fourth Perspective, I held the very biased position that assuredly the essence of my 376 page novel couldn’t possibly be revealed in a perusal of a single page from the book and that further more, no random page could give the reader a true inkling of the larger substance of the novel. Certainly, as a scientist and diagnostic surgical pathologist, I expected the laws of probability to dominate and since this wasn’t a coin toss where 50/50 chances would prevail, my perception, no my very firm intractable belief was that the random selection of a page, whatever its number would bear little fruit beyond perhaps offering the reader at most, a minor character sketch, some scene setting or simply a bit of novel transition. Wrong, Mr. Know-it-All! When I turned to read page 69 of The Fourth Perspective, I found myself comforted with the fact that on that page a large measure of the heart my CJ Floyd novel was indeed crystallized. The gist of the book is simply this. CJ Floyd, who has left behind his precarious life as a bail bondsman and bounty hunter to open an antiques and western collectible store, purchases an old book from a Nicaraguan immigrant, a book that as it turns out contains more than a dry history of 19th century Montana medicine. Tucked inside the book is a never-before-seen photograph from the 1869 Transcontinental Railroad, Golden Spike ceremony, a seminal even in American history. It is a prize that collectors would kill for and when the book’s former owner turns up dead, police peg CJ as a prime suspect. There was no way I thought to myself before again perusing the page that such a critical fulcrum point in the novel would appear on page 69, but there it was, and here it is for you to read, with a little set up if you please. CJ has sent his former bail bonding partner, Flora Jean Benson, to talk to the mother of a young man named Luis Del Mora who recently turned up dead just down the street from CJ’s newly opened antique’s store. Here’s Flora Jean’s page 69 conversation with the young man’s mother, Teresa Del Mora. Flora Jean examined the grade slips and nodded approvingly. “He seemed to be doing pretty good. As and Bs.” She set the grade slips aside and flipped the binder she was holding open. “The Role of the Transcontinental Railroad in the Opening of the West” was typed halfway down the title page. An “A,” circled in red, sat like a bulls’-eye just below the obvious term paper’s title. A note below that read, “Keep up the good work and I’ll teach you more.” The comment, which struck Flora Jean as somehow strangely out of place, was one that Flora Jean decided she’d best remember if she took on the case. “Looks like your son had a nose for history,” said Flora Jean, setting down the binder. “He did, and in Nicaragua as well.” Theresa signed. “Luis was mesmerized by history’s untold stories. But he was too unseasoned to understand that the stories of the past are usually told by those who are the winners – never the losers. In too many ways he was so much like his father.” Theresa’s voice trailed off to a whisper. I am not one who generally believes that random occurrences define ones destiny and I have never thought that the universe was moving necessarily toward or away from chaos. This may be due to the fact that by and large, I try not to take sound bites from TV or newspaper headline snippets, and turn them into my reality. My answer for more than a few things that happen in this world is most often “I don’t know.” But in this instance, I have to admit that if you read page 69 of The Fourth Perspective, you will find much of the essence of what the book is about squeezed into but a few paragraphs. Whether or not you stumble across this page like a blind pig looking for an acorn, whether this page appears to you otherwise fortuitously, or whether or not page 69 is part of some grand suspense writer’s scheme, I am unable to say. I will admit this, however. For a person whose entire career has been spent in medicine and science, and for someone who has little room or patience for explaining the random events of our world, I was rather amazed to find so much of the trigger point of my novel crystallized on page 69. Many thanks to Robert for the input. To read the first three chapters of The Fourth Perspective, click here. 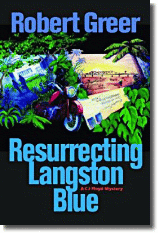 Click on the titles to read synopses and excerpts from the previous "CJ Floyd" mysteries: Resurrecting Langston Blue, The Devil's Backbone, The Devil's Red Nickel, and The Devil's Hatband. 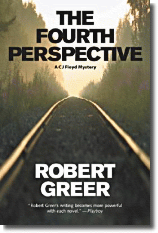 To read the Denver Post's rave review for The Fourth Perspective, click here. The Boulder Daily Camera review's bottom line: "The Fourth Perspective entertains with interesting characters and a good puzzle. It should please Greer's current fans and attract new ones." 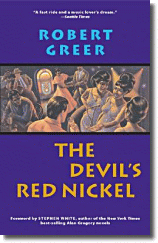 Robert Greer's literary honors include hitting the Los Angeles Times, Denver Post, Essence, and Blackboard best-seller lists; winning the Chester Himes Award; and being cited by Booklist for publishing one of the best mysteries of the year in 2003.